This is part 3 of my ULTIMATE Christmas Guide Roundup for this year! I did two others for girls & guys if you missed out on those. For the past couple of weeks I've been researching through tons of different blogs to see which ones had the best, unique, and variety of gift ideas for whoever you're shopping for. 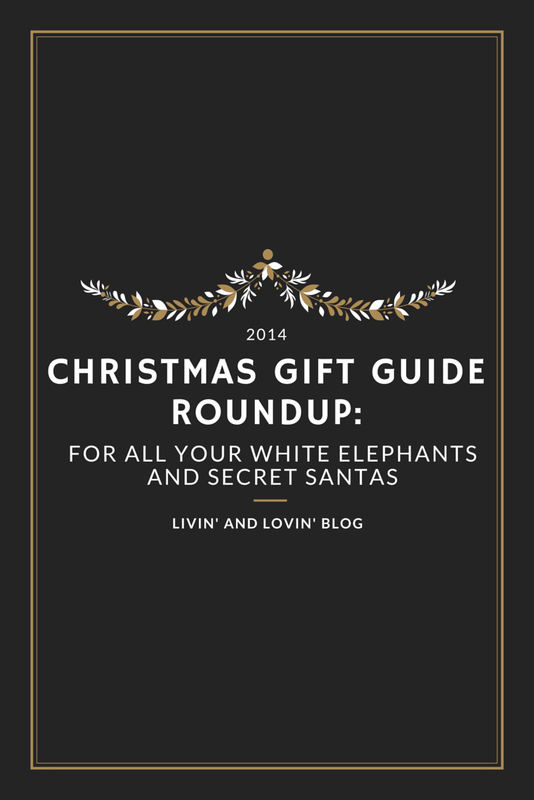 And today is all about your Secret Santas & White Elephant gift exchanges. Whether you're shopping for your best friend whose name you secretly pulled out of a hat or you're shopping for potentially anyone, these gift ideas are sure to make shopping for your Secret Santas. (Note: Most of these are for women but there are a couple gender neutral gift guides in there! I also have a few ideas as well, saved for the end!). Like my other gift guides, I will categorize these, although to only 3 categories this time: Unisex, Female, My Ideas (because this is my blog & I'm special :). I hope these posts will help you pick out some cool (or funny/weird, depending on the group of people you're shopping for) gifts! Girl in Betsey - All these gifts are pretty sleek--warm throw blankets, convertible chargers, a coffee maker, a chocolate basket, and a few more other ideas. And the great thing about these gifts are that you can get (most) of them expensive or cheaper, depending on what the spending minimum is for your gift exchanges. All the Joys - I love that Meagan features gender neutral gifts like Krystin from Girl in Betsy does, but they're different kinds of suggestions, a few being for people who are either older than 18 or 21--like mini liquor bottles, a bunch of lottery tickets (seriously, my cousin did this one year bought like $30 worth of scratchers and gave them with a ketchup bottle haha), or any kind of techie stuff for all ages, like portable speakers. She also suggests sports-themed things, which would be unisex if the group of people you're shopping for has both males and females as huge fans of sports (unfortunately my family wouldn't fall into this category--at least no one is a die-hard fan). The Preppy Scientist - Cute stationery, beauty products, and even a Scrabble-themed mug! Books, Beauty, & Bars - Gift ideas for under $15 - feat. gifts like cute Anthropologie mugs and a "minimergency" kit! Coming Up Roses - 15 gift ideas under $15 - feat. gifts like an inspirational quote print and a silicone ice ball maker... That one seems so interesting! Those random books you find in stores like Urban Outfitters - You know the ones I'm talking about--the ones about your poop or awkward family photos or all about bacon. They're the hilarious (and sometimes informative) books that will have you distracted for hours in the store! These are perfect for trolling on your friends and family, unless that's their personality... then you're actually buying the perfect gift for them! Gourmet Food Baskets - While my family wouldn't care for these too much, maybe the people you're shopping for would. If they are foodies always looking for new types of meat or cheese or any kind of food or if they just like to eat some good stuff, then these would be really yummy to give away. Practical Techie Gifts - Practical techie gifts are the most gender neutral gifts, I believe. These are things like portable chargers, speakers, devices (anything portable, really), or even some random things like fancy flashlights (some cousins trolled with this last year or the year before) or heating blankets (I got that one a few years back) or a body massager. These gifts can either make everyone want them or make everyone laugh at the loser I mean person who got stuck with them, haha. What have you gotten for Secret Santa/White Elephant gifts in the past? Thank you for featuring my gift guides, it means a lot and I love yours too! Have a great week! Sorry for the late reply but no problem! sorry for the late reply but no problem! Glad you enjoyed the other ideas as well!